Dieffenbachia (Dieffenbachia): growing, planting, caring. The dieffenbachia - a tropical plant with Germanic consonances - is a beautiful large indoor perennial with white and yellow leaves. Guaranteed exoticism - unless, of course, you live in the West Indies. A tropical relative of the arum, dieffenbachia is a vigorous perennial plant. It can theoretically reach 1.5 meters of height, so it is better to grow it in a large pot. Indoors, do not expect to see the white flowers of Dieffenbachia : it happens very rarely. Attention, sap is toxic: dieffenbachia should be handled with care. Tropical plant, your dieffenbachia will flourish around 20 ° C in a mixture of potting soil and earth, in a pot, inside. Put sand at the bottom of the pot to facilitate drainage. The dieffenbachia likes sifted light, : too close to a window the magnifying glass effect can burn the leaves. It needs a strong moisture, do not place it in a draft or in a dry room. Water once or twice a week during growth, adding twice a month a little compost juice. In winter, water a little, once or twice a month. Clean the leaves with non-calcareous water once a month, otherwise dust may block photosynthesis. 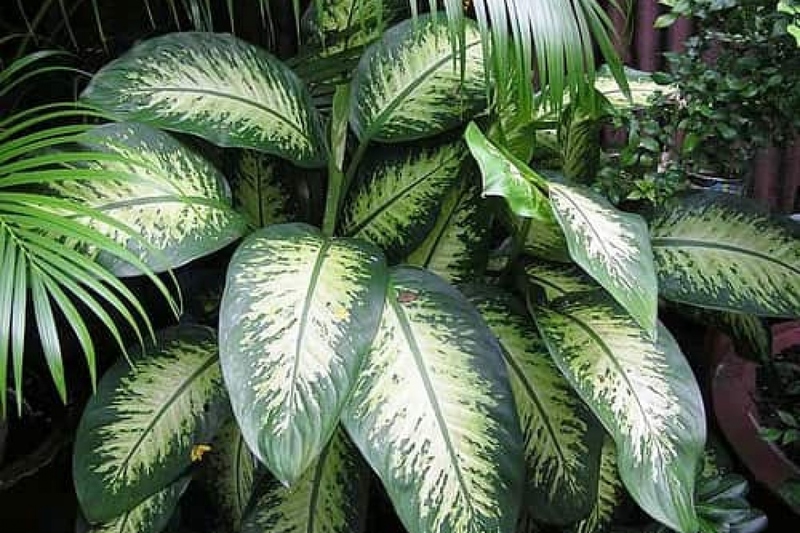 The dieffenbachia can grow the size of a small shrub, and afterward lose its branches from the bottom. In this case, prune its branches quite short between November and February. At the end of winter each year, repot your plant in a slightly larger pot, adding a mixture of garden soil and potting soil.